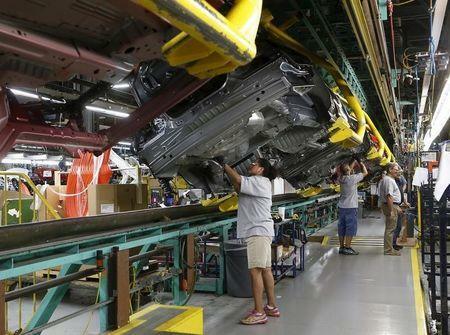 WASHINGTON (Reuters) - A gauge of U.S. business investment plans fell for a second straight month in September, pointing to a sharp slowdown in economic growth and casting more doubts on whether the Federal Reserve will raise interest rates this year. Other data on Tuesday showed consumer confidence slipped this month amid worries over a recent moderation in job growth and its potential impact on income. Housing, however, remains the bright spot, with home prices accelerating in August. That should boost household wealth, supporting consumer spending and the broader economy, which has been buffeted by a strong dollar, weak global demand, spending cuts in the energy sector and efforts by businesses to reduce an inventory glut. The continued weakness in business spending, together with the slowdown in hiring, could make it difficult for the Fed to lift its short-term interest rate from near zero in December, as most economists expect. The U.S. central bank's policy-setting committee started a two-day meeting on Tuesday. "The drift of data suggests that the first time the Fed will raise rates will be in the spring," said Steve Blitz, chief economist at ITG Investment Research in New York. Non-defense capital goods orders excluding aircraft, a closely watched proxy for business spending plans, slipped 0.3 percent last month after a downwardly revised 1.6 percent decline in August, the Commerce Department said. These so-called core capital goods were previously reported to have dropped 0.8 percent in August. The data was the latest dour news for manufacturing, which has borne the brunt of dollar strength, energy sector investment cuts and the inventory correction. Manufacturing accounts for 12 percent of the economy. In a separate report, the Conference Board said its consumer sentiment index fell to 97.6 this month from a reading of 102.6 in September. Consumers were less optimistic about the labor market, with the share of those anticipating more jobs in the months ahead slipping. There was a drop in the proportion of consumers expecting their incomes to increase and more expected a drop in their income. The downbeat assessment of the labor market follows a step down in job growth in August and September. Data ranging from trade to retail sales and industrial production have all suggested a significant loss of momentum in the third quarter. Housing continues to outperform the economy. A third report on Tuesday showed the S&P/Case Shiller composite index of home prices in 20 metropolitan areas increased 5.1 percent in August from a year ago after rising 4.9 percent in July. U.S. stocks were trading lower, while the dollar was little changed. Prices for U.S. government debt rose. According to a Reuters survey of economists, gross domestic product likely expanded at a 1.6 percent annual rate in the third quarter, slowing from a brisk 3.9 percent pace in the second quarter. The government will publish its advance third-quarter GDP estimate on Thursday. The dollar has gained 15.4 percent against the currencies of the United States' main trading partners since June 2014, undermining the profits of multinational companies like Procter & Gamble Co. and 3M Co. .
At the same time, a plunge in oil prices has squeezed revenues for oil field companies like Schlumberger and diversified manufacturer Caterpillar Inc .
Schlumberger, the world's No.1 oilfield services provider, said this month it did not expect a recovery in demand before 2017 and anticipated that exploration and production spending would fall for a second consecutive year in 2016. "It is hard for firms to commit to expanding plants and upgrading equipment in a global economy that continues to deliver so many speed bumps," said Diane Swonk, chief economist at Mesirow in Chicago. Shipments of core capital goods, which are used to calculate equipment spending in the government's GDP measurement, rose 0.5 percent last month after a downwardly revised 0.8 percent drop in August. Core capital goods shipments were previously reported to have dropped 0.4 percent in August. A 2.9 percent decline in transportation equipment spending helped to weigh down overall orders for durable goods - items ranging from toasters to aircraft that are meant to last three years or more - which fell 1.2 percent last month. Durable goods inventories fell 0.3 percent, the largest drop since May 2013, while unfilled orders declined 0.6 percent.